Award of Merit- Innovation into Practice. In both cases it will be made to a leading individual for their major contribution to the success of engineering for agriculture and the rural sector in Europe. The Award takes the form of a cast bronze replica statuette and is entitled Earth Man Tool and Sky. The original statue was made in oak and stood about 2.7m tall in the Mansion at Wrest Park, Silsoe, Bedfordshire, UK where the National Institute of Agricultural Engineering (NIAE) which was later to become Silsoe Research Institute (SRI), was based. It was sculpted by Lee Grandjean and unveiled on 9 July 1984 by Prof Ron Bell (the then Director) to commemorate the Diamond Jubilee of the NIAE. Following the closure of SRI in March 2006 the statue was returned to the sculptor, and the Director (Bill Day) and Governors of Silsoe Research Institute arranged for the sculptor to prepare the statuette of which several copies have been cast and donated to EurAgEng to form the basis of the Award of Merit. Prof Gerard Bot certainly fulfils the award criteria in his and his team’s influential work, addressing the urgent problems of saving energy in protected crop production and in controlling the climate of animal accommodation. He has done this through scientific analysis, measurement technology and dynamic modelling over a number of years. The integration of scientific and practical innovations has led to the idea that production in greenhouses will, by 2020, use solely sustainable energy rather than fossil fuels; and he has been a leader in moving from “energy saving” to energy producing with innovative materials for greenhouses. His reputation is international and is as well known by industry as he is by academics. 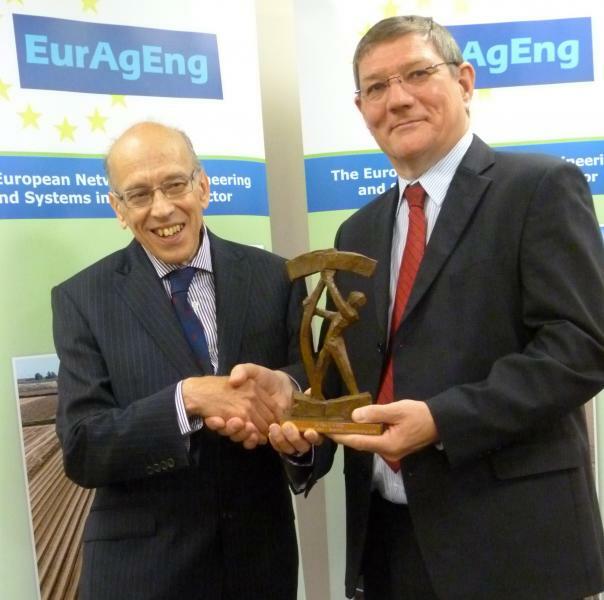 Although he “retired” some years ago, EurAgEng wishes Professor Bot many congratulations for his exemplary efforts in understanding the science behind these important agricultural engineering topics and receiving this prestigious award. Norbert Rauch is highly respected by the agricultural and agricultural machinery community in Europe as an individual, inventor and entrepreneur. After studying mechanical engineering at the University Fridericiana Karlsruhe and founding his own enterprises, Norbert Rauch joined the family owned Rauch Landmaschinenfabrik GmbH in 1979 and was appointed as Managing Director of Engineering in 1987. Under his leadership, with the support of his brother and other family members, Rauch Landmaschinenfabrik expanded into a modern, technology orientated, and highly specialized manufacturer of seeding and fertilization equipment. The factory is an efficient, worker friendly, sustainable and state of the art workplace. Rauch products are recognized for their quality, operational accuracy and precision as well as for safe and comfortable handling in Europe and worldwide. The highly sophisticated fertilizer distributors contribute to environmentally friendly and cost-efficient production processes in agriculture. The company holds 150 patents and has won 18 gold and silver medals at international trade fairs. Norbert Rauch is involved with the local industrial economy at the manufacturing base and serves on agricultural and agricultural machinery associations at national, European and international level. He is a member of various economic and technical committees who value his continuous commitment and expertise. Norbert Rauch applied the principle of sustainability long before this term came into vogue and inspires others to act in the same way. Dr Paul Miller has over 40 years’ experience in research and development relating to agricultural machinery and led the Chemical Application Group at Silsoe Research Institute – a group involved with many aspects of agricultural chemical application, including the management of spray drift from boom and air-assisted sprayers, nozzle performance, dose control and patch spraying (now known as variable rate application). He went on to hold the senior role of Director of Technology at the Silsoe Research Institute before leading his spray applications Group into commercial research and consultancy as part of The Arable Group. He has worked with agricultural pesticide application since the early 1980’s and was a visiting Professor at Cranfield University. He has a wide experience of both research approaches, relevant to academia and has a deep understanding of the link to commercial development of equipment and systems. Paul is the author of many refereed scientific and conference papers that have helped others understand the science involved, and he is recognised as the leading international authority in the field of chemical application and spraying technology and is indeed a very worthy winner of this prestigious award. Heinrich Müller, founder of Müller-Elektronik company in Salzkotten, was honoured at Land.Technik AgEng 2015 in Hannover for his ground breaking work which has helped to make Precision Farming a reality. His company has won awards at AGRITECHNICA going back to 1985 when he won a gold award for UNI-Control, a new product with a flexible hardware interface and menu driven operation. Since then he has contributed to the success of ISOBUS and been an active participant of KTBL and developed many new products with the needs of farmers clearly at the forefront of his work. Professor Margarita Ruiz-Altisent was applauded by family and colleagues alike, as she received the Award of Merit on the shores of Lake Zurich during AgEng2014 in Zurich. It was in recognition of her work as a pioneer in the development of applications of physical science and technology principles to solving problems related to the instrumentation and automation of biological materials. She is founder and lead researcher at LPF-TAGRALIA (Advanced techniques in Agri-Food at the Technical University of Madrid) and has been involved in many international projects, with 150 articles published and 5 patents to her name. Like a musician with perfect pitch, Sepp Knüsel has a perfect feel for engineering. In almost 10 years on the market, the Rigitrac has proved its high quality and perfect suitability for hillside farming. That Sepp Knüsel and his small team were able to produce such a tractor, with its unique features, is an outstanding achievement and EurAgEng is very proud to present its highest award, the Award of Merit - Innovation into Practice to Sepp Knüsel. This year the Award went to Prof Jos Metz, of Wageningen University in the Netherlands. Once again this Award, supported this year by Petersime NV and Fancom BV, has been given to an engineer who is incredibly enthusiastic about his work and an inspiration to all. He was professor of Agricultural and Biosystems Engineering at Wageningen University where he inspired young engineers and the international community alike. Professor Metz is still involved in international projects and has been dubbed the founding father of Precision Livestock Farming. 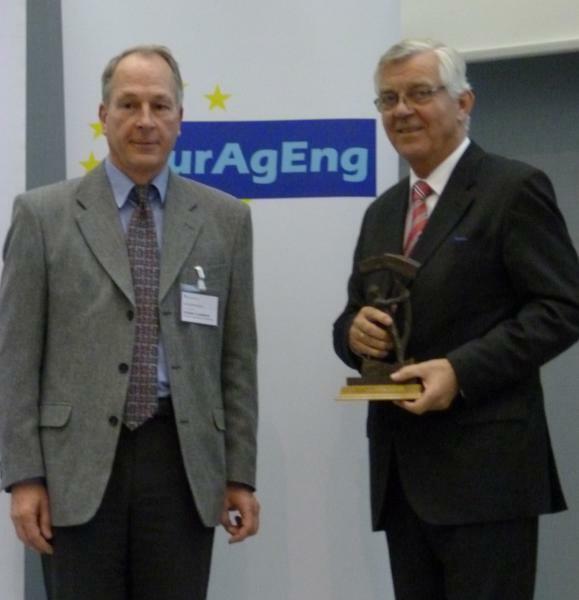 For the first time the EurAgEng Award of Merit was presented at LAND.TECHNIK AgEng2011 in Hannover, Germany just before Agritechnica. This year's winner was Franz Grimme, Managing Director of Grimme, well known for potato, sugar beet and vegetable technologies. The Award of Merit was presented at AgEng2008 to Dipl Ing Michael Teich, an engineer who had recently retired after 39 years of service from the leading tractor company, John Deere. In the picture, we see Dipl Ing Michael Teich (right) receiving the “Earth Man Tool and Sky” replica statuette from EurAgEng President Prof Florentino Juste (left). At AgEng2006, Ray Clay, recently retired from JCB, was the inaugural recipient of the Award of Merit for his work on JCB’s Fastrac. The picture shows Award of Merit winner Ray Clay (right) with Prof Bill Day (left) the outgoing EurAgEng President, and Prof Aad Jongebreur (centre) the incoming EurAgEng President.